1. Blanched pork ribs with boiling water for 1 minute. Pour away the water leave it aside. 2. Bring water to boil. Put in prawns for 3-4 minutes or until cooked. Remove prawns. 3. Add in pork ribs to the boiled water. Let it simmer on low heat for about 40-50 minutes or until pork ribs is soft. Remove pork ribs and set aside. Add salt and pepper to taste. Keep warm. 4. Lightly beat the eggs and add a few drops of pink coloring. Fry the eggs and cut it into strips. 5. Fry sliced shallots in on low fire until crispy. remove and set aside. 6. Blanch chives in boiling water for 1 minute. 7. Cook noodles as per cooking instruction. Pour in soup and add prawns, pork ribs, eggs, chives and crispy onions. 8. If you like a spicy version add 1 tsp of sambal belachan (Chili paste). When I was growing up, one of the biggest family celebrations was my late grandmother’s birthday. Every year on her birthday, our family would host a big birthday party for her and friends and relatives were invited to our home for her birthday dinner. On the day itself, we would make many Nyonya dishes for the dinner as well as a big pot of Nyonya Lam Mee or “Birthday Mee.” Check out this post by Siew Loon and learn more about this delicious dish. Nyonya Lam Mee is also known as “Birthday Mee” in Penang and it is usually served during birthday celebrations to wish the birthday boy or girl longevity. Recently, a close friend of mine from noodles.com.my which produces organic noodles gave me a few packets of noodles which is free of presevatives and straight away it came to Bee Yinn’s mind that I should make Lam Mee using the noodles. This healthier version of Lam Mee turned out so well that my family enjoyed it so much and I thought this is something worth sharing with Nyonya Food readers. 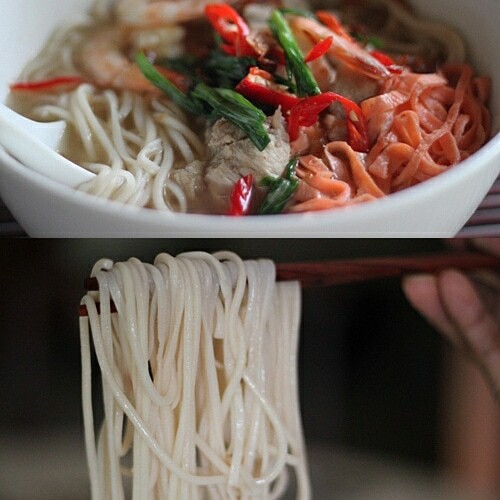 Traditionally Nyonya Lam Mee is yellow rice noodles cooked in gravy made of stock of prawns and pork ribs or chicken. It is then served with toppings like colored shredded eggs, prawns, pork ribs, shallots crisps and chives. The specialty of this dish lies in the gravy where it gives you a perfect blend of seafood from the prawns and sweetness of the pork ribs. The Nyonyas will always serve Lam Mee with Sambal Belacan as it completes the flavour of this dish. Blanched pork ribs with boiling water for 1 minute. Pour away the water leave it aside. Bring water to boil. Put in prawns for 3-4 minutes or until cooked. Remove prawns. Add in pork ribs to the boiled water. Let it simmer on low heat for about 40-50 minutes or until pork ribs is soft. Remove pork ribs and set aside. Add salt and pepper to taste. Keep warm. Lightly beat the eggs and add a few drops of pink coloring. Fry the eggs and cut it into strips. Fry sliced shallots in on low fire until crispy. remove and set aside. Blanch chives in boiling water for 1 minute. Cook noodles as per cooking instruction. Pour in soup and add prawns, pork ribs, eggs, chives and crispy onions. If you like a spicy version add 1 tsp of sambal belachan (Chili paste). Lam Mee is always my favorite!!! Simple but taste great. Can have it everyday!! !